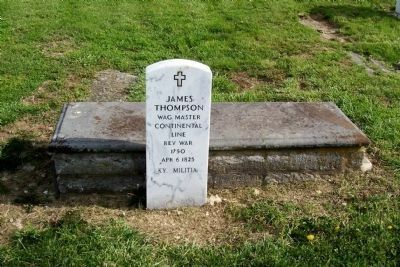 Historical Marker #1371 is located at the Fork of Dix River Baptist Church cemetery and marks the burial site of Revolutionary War veteran, James Thompson. Before Kentucky separated from Virginia and became a state in 1792, Thompson was appointed by commission on January 6, 1781 to become the first surveyor for Lincoln County at the first court held in the state. Serving as Justice of the Peace for Lincoln County in 1780, he also surveyed what would become Garrard County and became Garrard County Justice of the Peace in 1797. Thompson was appointed a Trustee of Kentucky Academy in 1794 as well as the Lancaster Academy in 1798. 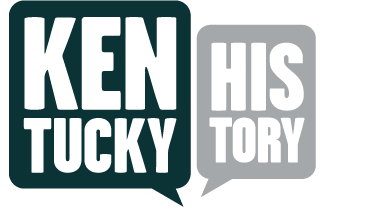 He also worked as a state representative for Garrard County in 1803 and was the first state senator for Garrard County from 1804 to 1806. In December of 1798, the General Assembly passed an act to establish several seminaries or academies throughout the Commonwealth. This act granted the authorization of using six thousand acres in each county for each school. Thompson was a trustee for two such schools: the Kentucky Academy in Woodford County and Lancaster Academy in Garrard County. 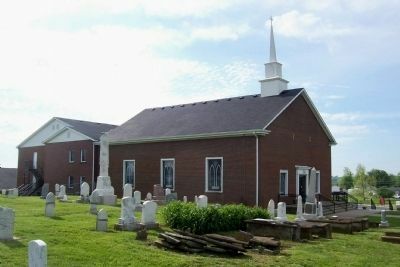 The Kentucky Academy was granted a charter on December 12, 1794 in Pisgah. Distressed at the management and religious factionalism of Transylvania Seminary, the founders of the new academy would only allow half of the trustees be Presbyterian ministers. Because of both the Kentucky Academy’s accomplishments, and management changes at the seminary in Lexington, the two schools began discussion of merging together. On January 1, 1799, Transylvania University was formed from the Kentucky Academy and Transylvania Seminary. The first law and medical departments in the west were added to the college shortly after. Once the new school was formed, Thompson was no longer on the board, however, Governor James Garrard, Garrard County’s namesake, was a trustee. This academy system failed in a number of ways: inadequate funding, poor location, and many times the trustees were self-appointed who knew little about education while merely seeking personal gain. Although many of those academies – or seminaries if it was a girls’ school – did become colleges we know today (Kentucky Academy became part of Transylvania University, Rittenhouse Academy into Georgetown College, and Bethel Female Institute into Bethel Female College), it is currently unclear what happened to Lancaster Academy. Many of these schools were closed by the mid nineteenth century, which is very likely what happened to the Lancaster school. Ashlee Chilton, “James Thompson, 1750-1825,” ExploreKYHistory, accessed April 22, 2019, https://explorekyhistory.ky.gov/items/show/759.